memoQ 5 introduced the great feature of pre-defined term base settings for case sensitivity and prefix matching per language. Before importing some content into new TB, we just have to select right defaults. But what to do with older TBs? Or what to do if we want to change settings for some entries, but not all of them? You can either do a lot of clicking in the memoQ, modifying terms one by one, or use a quick workaround with the editing step in a spreadsheet. Actually Istvan Lengyel from Kilgray suggested a much easier solution than the one described below. To change attributes like Case sensitivity for the whole term base, one can just open the term base in the memoQ TB editor, select all entries by pressing Ctrl-Shift-A and set the desired value. There will be a dialog box with request for confirmation and that’s all. The procedure below can still be useful for groups of entries or some values which cannot be changed in editor, like creator ID. 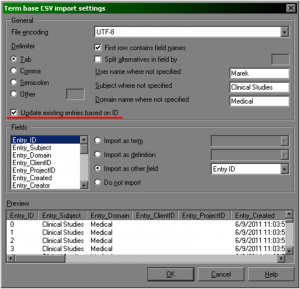 Changing term settings for an existing term base (Case sensitivity, Prefix matching) for all (or many) terms in a term base requires five steps: the content of a term base have to be exported into CSV format, imported into a spreadsheet (e.g. Excel or Calc), introduce required changes, save the content as a Unicode text and import it back into the term base. Select Tools > Resource console. 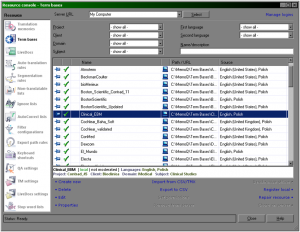 In the Resource panel select Term bases. 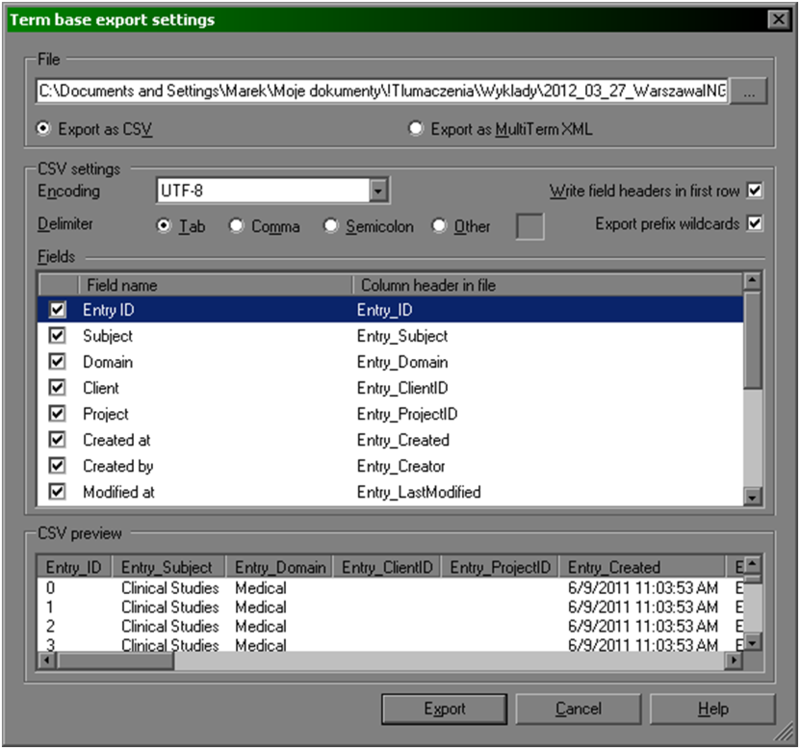 Select the term base you want to modify and click Export to CSV command. Term base export settings window will be displayed. Use the File field to select the location of exported file. In the CSV settings pane select Tab for a Delimiter option. In the Importing text file window select the file saved in step 4 (file extension .csv). Import text wizard – step 1 of 3 window will be displayed. Click Next. You can freely edit colum content, e.g. changing term base metadata or the terms themselves. To change the case sensitivity settings from Permissive to No, press Ctrl-H to invoke Search & replace window. In the Search field enter CasePermissive. In the Replace to field enter CaseInsense. For other settings, see reference table at the end of the post. Save changes by clicking File > Save as > Other formats and selecting Text unicode in the Save as type field. Two warnings windows will be displayed, you have to click OK in both. Close Excel (this is important). Select term base the content of which was modified and click Import from CSV/TMX command. Select the file saved in step 12 (extension .txt). In case of error message, close Excel (step 13) and repeat steps 16 and 17. 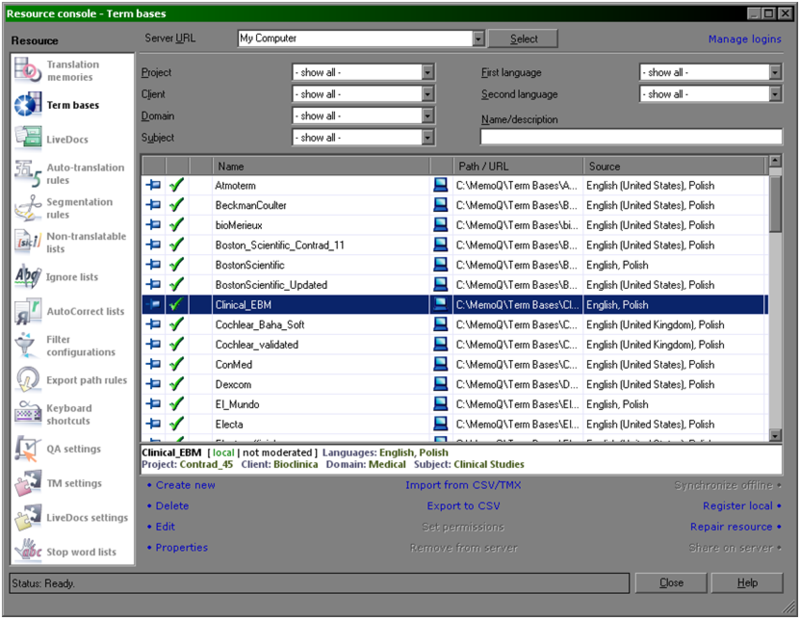 Term base export settings window will be displayed. Select Update existing entries based on ID check box. Click OK. The term base will be updated with modified settings. Entry_ID Identifier, subsequent nubers starting from 0. Entry_Subject Metadata Subject field. Free text. Entry_Domain Metadata Domain field. Free text. Entry_Client_ID Metadata Client field. Free text. Entry_ProjectID Metadata Project field. Free text. Entry_Created Date and time of entry creation. Format: M/D/YYYY H:MM:SS AM/PM. Entry_Creator The ID of user, who created the entry. Free text. Entry_LastModified Date and time of entry modification. Format: M/D/YYYY H:MM:SS AM/PM. Entry_Modifier The ID of user, who modified the entry. Free text. Entry_Note Content of the Note field. Concept level entry. Entry_Image Content of the Image field. Concept level entry. Entry_ImageCaption Image caption. Concept level entry. [Language]_Def Term definition for [Language] E.g. English_Def, Polish_Def. Term level entry. [Language] Term in the defined language. E.g. English, Polish. Term level entry. Term_Example Example of term usage. Free text. Term level entry.